The IAM experience. : Making progress in the CNI region. Making progress in the CNI region. In an effort to keep my blog a bit more up to date, I've kicked off the next instalment a bit earlier. Looking back at the past year or so, we've arrived at a place where a number of Associates are close to their Advanced Test. A collective effort that has been put in by our small group, to enable our Associates to progress without delay, was looking like a perfect storm in the making. By this I mean a number of riders bunching up to go thru their Advanced Test. What I've admired here is the way we've been able to work together, doing a bit of switching around as it suited, just to keep our Associates moving forward. With both Lloyd (fellow Observer) and myself on rotating shifts, this often clashes with Associates only available easily at weekends. Let's not forget we all need to fit a job and family life around the Observer task. In fairness there's also been a certain amount of shuffling done by various Associates to make their way thru the learning stages. The Associates that I've spent time with, all guys from different walks of life, there's one thing they've all had in common. An open minded eagerness to improve their biking skills. It's only fair that I pay tribute to Geoff James, the ever enthusiastic chap I first conversed with on the Kiwibiker website, then subsequently he's seen me thru to the current stage I'm at. Only fitting that in recent days Geoff was offered the position of Examiner for our CNI region, certainly a just reward for the effort he's put into revitalising IAM in his patch. Geoff certainly won't be short of Associates to practise his new title on! This will shortly kick up another gear, or at least that's how I'm seeing it. We have a number of trainee Observers in the wings, which will be signed off in months to come, and the cycle will start all over again. The main difference now though, we can handle a few more Associates coming thru. Or put it another way, we now have capacity to take on more Associates to keep the group growing. Our waiting list is relatively short, so it won't be long before we're open to taking in fresh Associates. Have to admit the article is well written, it certainly embodies the relaxed but thorough approach IAM takes. Now for the responses to what Tony kicked off with Sean aye? 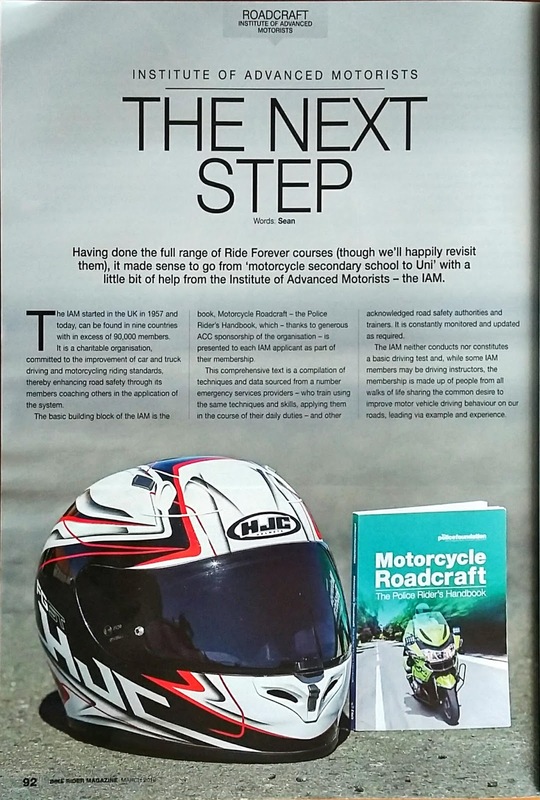 For me the topic of post license training, especially for motorcycles, is a no brainer. 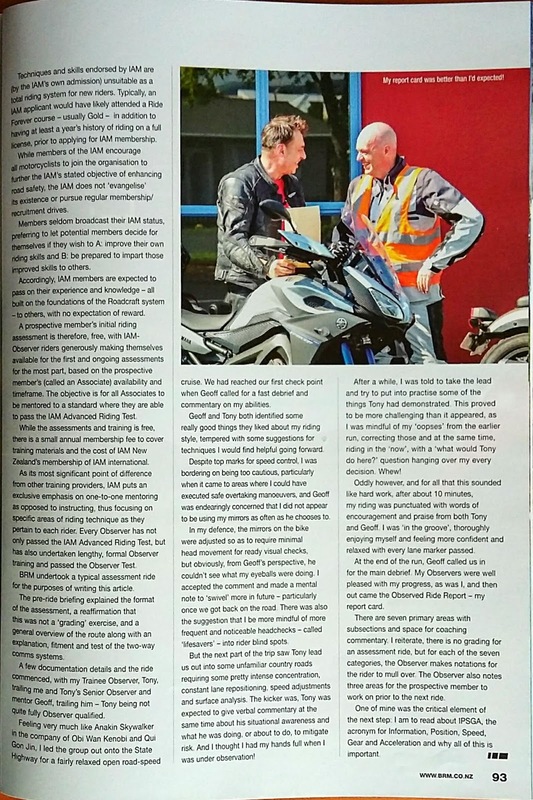 Talking to some of the providers who run the Rideforever courses, the reluctance against further training shown by the motorcycling population overall seems to be waning slowly. In practical terms the Rideforever series, and to a much greater degree what AIM does, is merely a stopgap measure to improved licensing standards. Until the powers that be get around to that though, well let's just say I wasn't going to wait for an official directive to improve my skills. Fortunately bikers seem to be getting the message that improving their skills is worthwhile, whether it be avoiding a coffin or hospital food. On a more personal note, I've found the IAM lads overall very much devoid of ego, so it makes for a genuine non threatening learning environment. As we grow, this will require some guarding so as to not get off track on that topic. A recent social outing for CNI was well received by all who managed to take part. Now we just have to try and have more of these. On a rather wet Saturday, have just been out with a new Associate in our region. He's done a number of Rideforever courses, asked what next of the trainer, and he's ended up talking to IAM. The really neat thing for me, is how a rider who has taken on board all the Rideforever coaching, comes to IAM with all the basics for Roadcraft already instilled into him. No surprise there, for Roadcraft is the basis for Rideforever. The difference is in the detail of course. Not for everyone I'll admit, but then biking safely and smoothly need not be a boring activity at all. This misconception that IAM and Roadcraft is boring and slow, is fading away gradually. Heck, some of us even partake in track days. A great read, thanks Rob. At the time of my accident I was considering the IAM route and was talking with Stuart Nelson of two Bald Bikers about how to start. Given I'm not yet at the stage where I feel I can totally control a motorcycle in all situations I'm not currently riding, and once I can I'll be doing a RiseForever Silver and Gold course to get my skills up again. Then I'm keen to embark upon the IAM again. Thanks for all the hard work you guys are doing. Kind words Simon, but it's a collective effort by many folks, not just IAM. I really admire you for fronting with the Rideforever crew on Shiny Side Up events, to tell your story. It makes for very sobering reading. In time, when you're ready, I'm sure Stu will put you on the right path. Best wishes with your ongoing recovery.